The Buddha Board is an amazing Zen resource for freeing your mind, liberating yourself from attachment and jump-starting your creative spirit. It's an essential tool we use in the Zen Brush Workshops and Creative Coaching. You paint with ordinary water on the Buddha Board surface, yet it looks exactly like black Sumi ink on rice paper. It comes complete with its own Buddha Board, stand/water holder and brush. You can use it to create beautiful spontaneous paintings. Yes, much better than what you see on the right. Then, as the water dries, right before your eyes your beautiful, precious painting fades away to nothing. This immediately brings up our attachment. My beautiful painting is gone. I may never be able to paint one that good again. But the Buddha Board, like life itself, will not bend to our pleas. It shows us again and again that everything changes. Not only does our Buddha Board painting change, but our children, our health, our job, and our life. All things change. Nothing is permanent. This is the lesson of the Buddha Board. And it is one of the most valuable lessons we can learn. We may think this lesson might depress us. We don't want the things we love to change. But it's really this refusal to accept change that makes us suffer. When we finally accept that change is part of life, we begin to see how truly precious our life really is. Letting go of the old painting allows new paintings to emerge, each one better than the last. Letting go of the way our children were, allows a fantastic new person to emerge. Letting go of our old self-image allows us to grow into our full potential. You will find the Buddha Board a most valuable tool in your journey as both an artist and a human being. Good news. 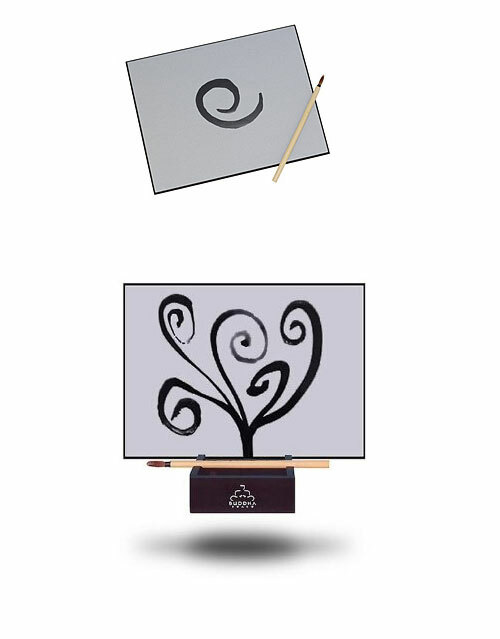 You can now buy the Buddha Board from Amazon.com at the discounted price of only $28. That's $5.00 less than the manufacturer's price. This is the lowest price I've seen on the Internet. And a very small price to pay for Enlightenment.